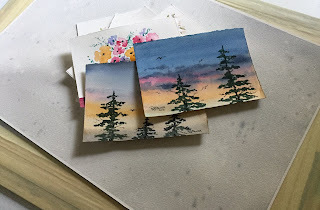 I was trying to figure out what I could use for a new backdrop for my watercolor paintings that I put up on Etsy for sale. I tried looking around the house to see if I had a cool new spot I could use to photograph my art. A new spot that also had great natural light. I decided my original spot to photograph my art was the best. It has great lighting, if I can get to it at the right time of day with the right amount of sunshine. Works like a charm every time. I wanted a more creative backdrop than just the wall or just a plain white canvas panel. As I was searching for little paintings to add to my Studio SALE I found an unfinished background for a painting. It was blue. I used that for a few paintings. But I had a lot of trouble getting the blue in one of the paintings to photograph properly. A day or two later, I came up with the perfect solution! I would use the backside of the blue background painting. It is an awesome 300 lb. half sheet of 100% cotton rag archival watercolor paper. I decided to paint a new backdrop with neutral colors! I wanted to keep it pale and simple. I used Carbon Black and Neutral Tint. I added a few splatters of clear water and a few splatters of my two colors. I must admit I am very pleased with my result! I photographed a few of my Studio SALE paintings and I do think they turned out pretty good. Pop on over to my Squier Etsy Shop and take a look. 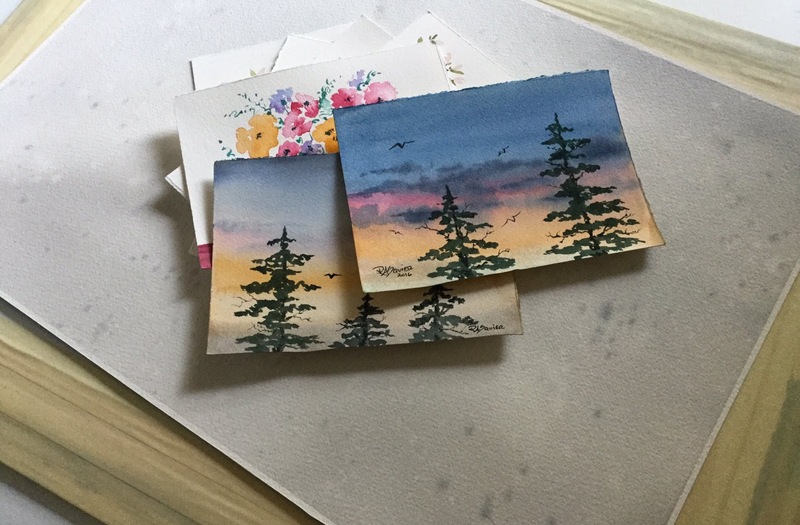 You may find a cute little painting you just have to buy!